This is the study plan I used to pass the ACSM Personal Trainer Exam with only 1 month of studying. So, I know it works! This is the exam study guide, which is a part of my longer Getting ACSM Personal Trainer Certification in 1 Month page. That page details all the steps I took to get the certification - this page is specifically about how to study for the test. 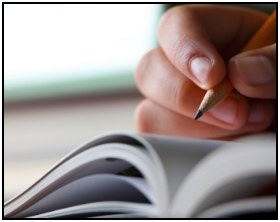 To study for and pass the exam that fast requires some serious elbow grease on your part. You must put in the time and energy to make it work. Remember how I told you not to do the chapter review tests at the end of each chapter in the ACSM's Certification Review book? Well, do them now. By not doing then ‘till you've finished the book, you'll see what you retained most from your read-through of the study guide. And you'll find out what you're weak on and need to review. Once you've done and reviewed all the chapter end tests, it's time to move on to the full book review tests at the back of the book. The one in Appendix A is right on the mark; do it and review your wrong answers. For the one in Appendix B that deals with MET calculations (stuff you need to know) and Chapter 12 Electrocardiography stuff (that you don't need to know): Just answer the questions that deal with relevant material and review those; ignore the rest. Go though the Knowledge, Skills, and Abilities list for Personal Trainers in the back of ACSM's Resources for the Personal Trainer (Pp. 497). Mark any you don't feel comfortable with, look them up, and study them. Go to the ACSM Online Learning Center and take the main practice test ($49.99). This will give you a feel for the type of questions on the exam, as well as the format. The online review test was exceptionally helpful for me. With the online test you've learned what taking the exam is like (kind of), as well as what sections you need to focus on for more studying. So, take the online courses for the section(s) that you were worst at. I think this is helpful because it gets you the information you need to study in yet another medium. This use of repetition (reading the information in multiple books), and now studying the info again online will increase your retention. If you have any more time, use it to study the subjects covering the majority of the test. A breakdown of the test’s 8 sections, showing how much of the exam is devoted to each, is below. I bought some Non-ACSM flashcards to study for the test on Amazon.com and, frankly, didn't find them helpful. The ACSM has a certain flavor in the information that they present, and how it's presented. And thus, the ACSM’s materials correlate well with how the material will be presented on the test. I don't recommend any non-ACSM stuff because the information might not be what the ACSM is looking for. It may even feed you contradictory information. Stick with the official ACSM Personal Trainer Exam study materials - they're more than sufficient. 8. You're Ready. Register For Your Test. You've studied all you can. 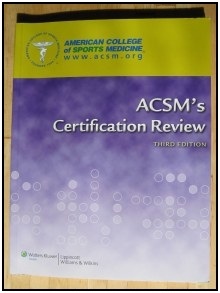 Now go back to the main page on how to get certified as an ACSM personal trainer and schedule your exam. • Click here to leave 'Passing The ACSM Personal Trainer Exam: How I Did It' & go back to the Home-page!